Roy has been working in creative educational environments for 25 years supporting leadership, staff and students. Emma has a background in performing, script-writing and directing. Kristina is a singer and executive coach active in the arts, business and education. 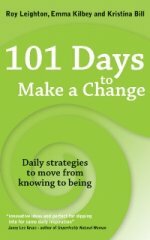 Fabulous book that can be used to overhaul every aspect of one's life to get the best out of ourselves. Transformational! I loved this book it gave me so much inspiration to transform my life. The principles of change management and personal transformation have been used to great effect at my Academy. Roy, Emma and Kristina are very talented individuals. A really good book to own.